[使用した共通機器]　This research was supported by the Japan Advanced Plant Science Network by providing the LC-MS/MS instruments for hormone measurements. [内容紹介] Plants produce jasmonoyl-L-isoleucine (JA-Ile) as a major defense signal during herbivory and wounding. The biosynthesis of JA-Ile is mediated by enzymes known as JASMONATE RESISTANT (JAR) genes. Using transposon tag lines inserted into the OsJAR1 gene, we showed that OsJAR1 is responsible for wound-induced JA-Ile biosynthesis in rice. Moreover, rice plants deficient in OsJAR1 function (and JA-Ile biosynthesis) were male sterile, suggesting that JA-Ile is also essential for rice pollen and seed development. 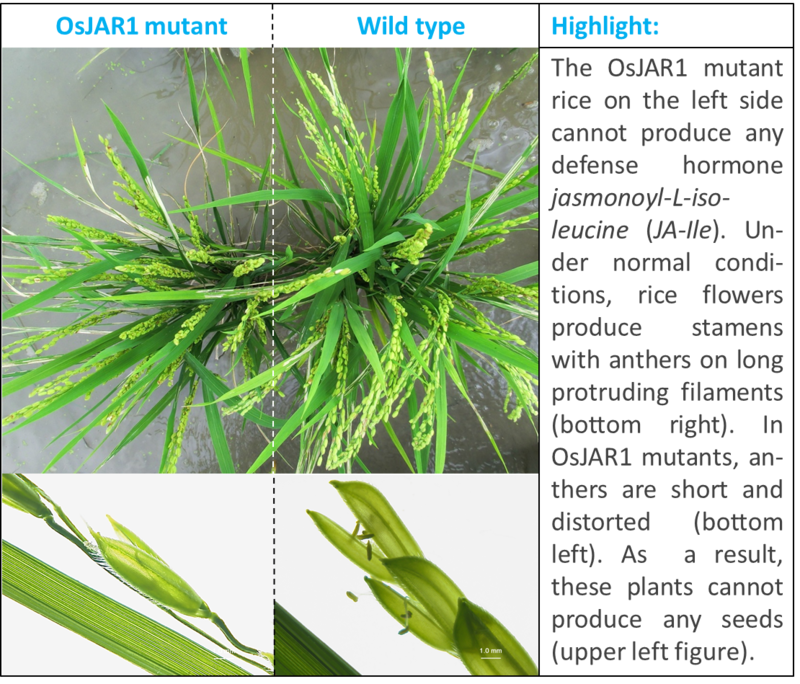 In the future, we will use the Osjar1 mutant plants to unravel JA-Ile regulated defense responses and involvement of this hormone in reproductive development of rice plants.